so that we can better serve New York State moms, dads, and families. All proceeds benefit the essential programs and services of the Postpartum Resource Center of New York. Donate now using the button below. 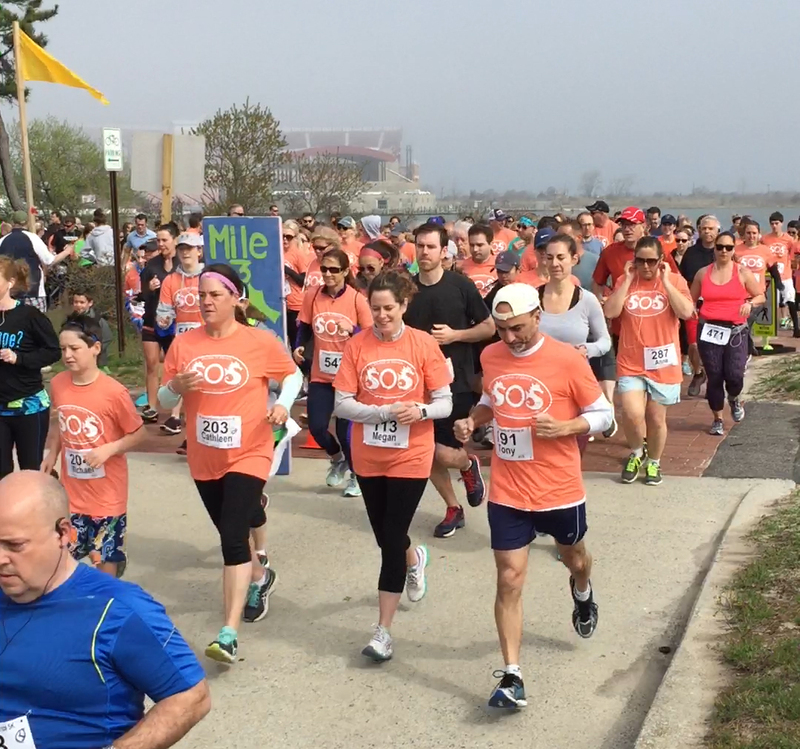 For this year's 10th Annual Sounds of Silence 5k/10k Run, we are offering a 50/50 Fundraiser to benefit the Postpartum Resource Center of New York. The drawing will take place during the event After Party (details are below). Purchase your ticket(s) now while they last. Click here to order securely or go to: postpartumny.org/sosrun2018raffle. Drawing to be held on Saturday, May 12, 2018 at the Sounds of Silence 5k/10k Annual Run Fundraiser After Party at Fatfish Wine Bar and Bistro, Bay Shore, NY. NOTE: Your ticket(s) will be mailed to you. You do not need to be present to win. All prize awards are based on the sale of all 300 available tickets. 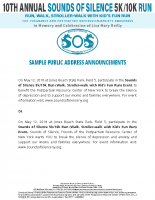 The 10th Annual Sounds of Silence 5k/10k Run (Walk, Stroller-Walk with Kid's Fun Run) at Jones Beach State Park will take place on May 12, 2018. For directions to the event, please use the map below. First, click on the red marker, then click on "Get Directions" at the bottom of the pop-up window. Please know that if you are not able to participate in this event in any way, you can still help us with our Mission by making a donation. Click on the Donate Now button below to make a gift in any amount. 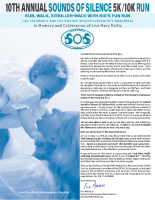 Sounds of Silence, Friends of the Postpartum Resource Center of New York is a fundraising committee of our non-profit 501(c)(3) organization. Tax ID# 11-3449880. To learn more about Sounds of Silence, please go here. 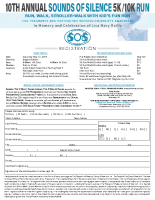 All New York State schools and colleges are invited to participate in the 10th Annual Sounds of Silence 5k/10k Run (Walk, Stroller-Walk with Kid's Fun Run) For Perinatal Mood and Anxiety Disorders Awareness. The event takes place on May 12, 2018 at Jones Beach State Park, in Wantagh, New York. 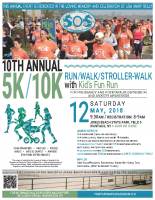 The course takes runners / walkers and stroller-walkers on a 5k/10k course on the wonderful Jones Beach Boardwalk that features beautiful views of the beach and ocean. Following the 5k/10k run, there will also be a Kids Fun Run. Free pre and post race snacks are provided. 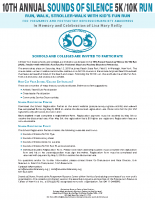 The School/College Registration Packet contains the following materials and forms. You can download the individual forms seen below. + Individual Student Registration Form. Please note: Each attending student must complete the registration form and his or her parent/guardian must sign the waiver. Registration form must be completed and returned with payment by Spring 2018 to receive the discounted rate. 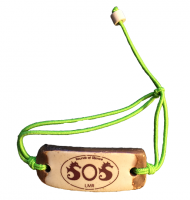 Help spread awareness and break the silence of perinatal mood and anxiety disorders with our Sounds of Silence bands. Each of these custom bands is handcrafted in Indiana. 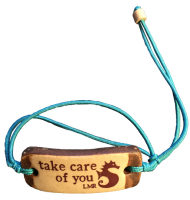 They are made of a clay piece with a colorful elastic cord (color bands vary). The bands are waterproof so you can wear them 24/7! And, they are adjustable from 5" to 8", so, one size fits most. Order them securely at our store right here at our website. Click here to order. 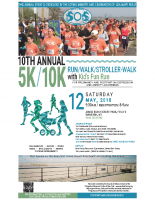 Join us on May 12, 2018 at Jones Beach State Park, for the 10th Annual Sounds of Silence 5k/10k Run (Walk, Stroller-Walk with Kid's Fun Run). Become a Sponsor in an event that benefits your customers – moms, dads, and families on Long Island and throughout New York State. Complete details are in the sponsorship form below. Please click on the form below to view and download. Secure your Sponsorship now using the secure form below or download and complete the pdf form below and pay by check. Please make check payable to: Postpartum Resource Center of New York. 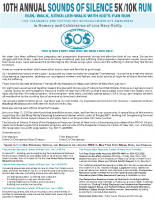 Mail to: Postpartum Resource Center of New York, Attn: SOS Run 2018, 109 Udall Road, West Islip, NY 11795. Seahorse Sponsors* ($1,000) — Thank you to Weber & Grahn , Zucker Hillside Hospital Northwell Health and Forest Electric for your Sponsorships! Corporate logo on race T-Shirt | Distribution of marketing materials and/or product samples in race swag bags (500 bags) | Logo link on registration website and PRCNY website | Social media recognition | Facebook, Twitter, plus email. *Multiple Sponsorships Available. Swag Bag Sponsor* ($500) — Corporate logo on race T-Shirt | Opportunity to provide promotional company literature within event gift bags. *Multiple Sponsorships Available. T-Shirt Logo Sponsor* ($300) — Corporate logo on race T-Shirt. *Multiple Sponsorships Available. All artwork (logos etc.) must be submitted by April 13, 2018. Please email artwork to: info@postpartumny.org | Preferred logo art formats (Vector - Adobe Illustrator .ai or .eps). Acceptable logo art formats (ai, eps or high-res jpg, png, pdf). Please do not send artwork taken from your website – it will not reproduce well for printed materials. Thank you! Sponsorships - Please choose from the drop down menu. * LMR Visioning Educational Series Sponsor ($10,000)Take Care of You Sponsor ($5,000) Parking Sponsor ($3,000) T-Shirt Sponsor ($3,000) – SOLD OUT – Thank you American Maintenance!Timing Sponsor ($2,000) – SOLD OUT – Thank you BERDON LLP • Accountants and Advisors!Tent Sponsor ($1,500) – SOLD OUT – Thank you Long Island Canopy!Water Station Sponsor ($1,500) – SOLD OUT – Thank you South Oaks Hospital Northwell Health!Award Sponsor ($1,000) – SOLD OUT – Thank you to The Donaldson Organization!Seahorse Sponsors ($1,000) – Multiple Sponsorships Available. Thank you Weber & Grahn, Zucker Hillside Hospital – Northwell Health and Forest Electric for your sponsorships!Swag Bag Sponsor ($500) – Multiple Sponsorships Available.T-Shirt Logo Sponsor ($300) – Multiple Sponsorships Available.